Shows the site of the nation's first Gold Rush. 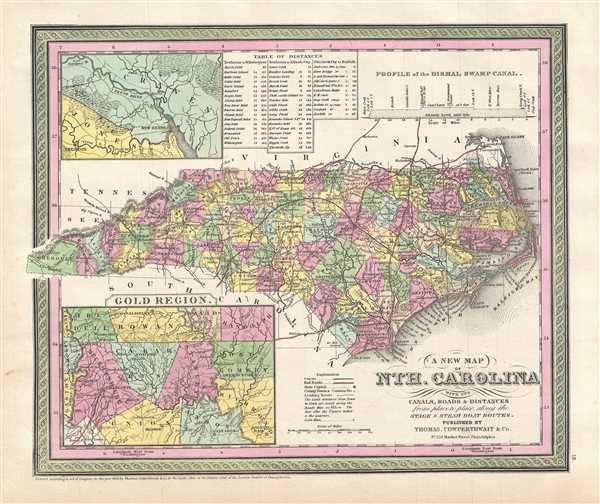 A fine example of Samuel Augustus Mitchell's important 1854 map of North Carolina. This map shows cities, topographical features, railways, ferries and roads with color coding at the county level. In addition to cartographic information this map is full of practical data for the armchair traveler including a profile of the Dismal Swamp Canal (an important trade artery in the region), a Table of Distances, insets of the vicinity of New Berne and the Carolina Gold Region. Of particular interest is Mitchell's focus on the North Carolina gold region highlighted by an inset in the lower left quadrant. Gold was first discovered in Cabarrus County North Carolina in 1799 by twelve-year-old Conrad Reed. Reed discovered a seventeen-pound gold nugget setting of the nation's first Gold Rush. Additional gold deposits were soon discovered in neighboring Montgomery, Stanly, Mecklenburg, Rowan and Union counties. The Carolina Gold Rush was a major factor in the settlement and population of the western parts of North Carolina. Very good. Minor foxing at places. Rumsey 0537.019 (1846 edition). Phillips (Atlases) 814.